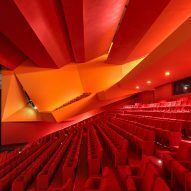 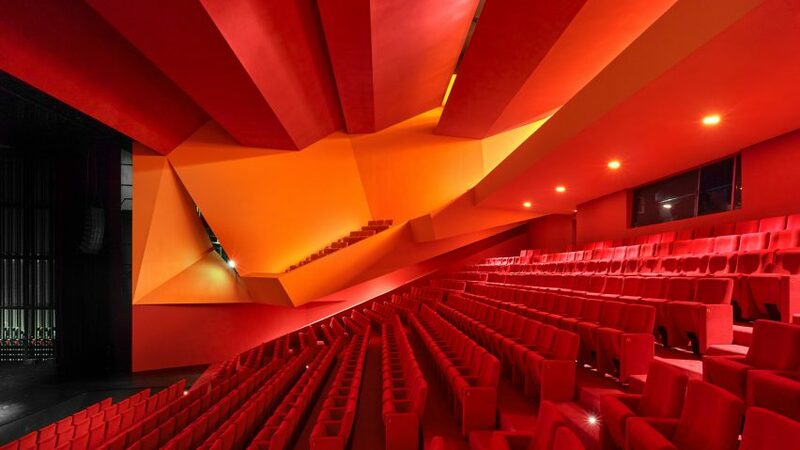 The French architects designed the Théodore Gouvy theatre as part of a drive to regenerate the town in north east France, which has seen high levels of unemployment since the area's coal mines closed in the 1990s. 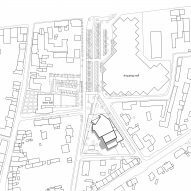 "Culture is seen as one possibility for resolving the accompanying social and economic difficulties in the town," said the architects in a statement. 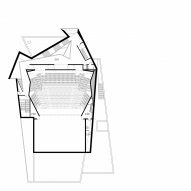 "The theatre has become a symbol of the town's renewal, and its position is generating a new public space in the town centre." 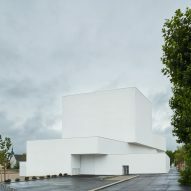 "Its unusual shape and dimensions give it an streamlined silhouette, the lines of which ensure visual transition between the various parts of the programme while keeping on the same scale as the town," explained Dominique Coulon & Associés. 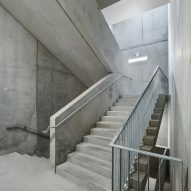 The route through the foyer to reach the auditorium is "deliberately spectacular and theatrical", with carpeted staircases and ramps winding up two stories around a central void. 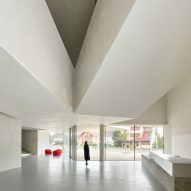 "The uniformity of the untreated plaster and the softness of the carpeted floor contribute to the feeling of being in some kind of cocoon," said the architects. 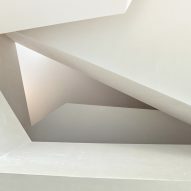 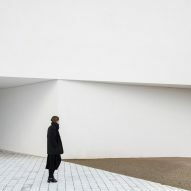 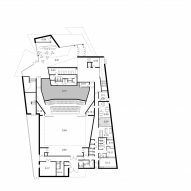 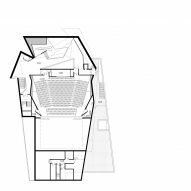 For the auditorium space itself, the architects employed a contrasting aesthetic to signal a "complete break" with the "nuanced surfaces" of the exterior and the foyers. 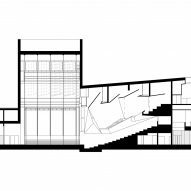 The bright palette is intended to "lend density to the space, affirming it as the main feature of the project, with colour sanctifying the idea of performance".